One of the greatest ever writers of the English language died sometime this month, 400 years ago - leaving behind a canon of work that would be read, enjoyed, studied and performed for centuries more. Long may he continue to inspire. As an English Literature graduate, I have a particular fondness for Shakespeare. His playful ability to weave vast and complex tapestries with his words, intricate webs with layer upon layer of meaning, was one of the discoveries I made in my early school days that lead me to want to study English Literature at University. "I am a man more sinn'd against than sinning." I struggled to read as a child, I lagged behind peers in our reading classes, I found it hard to keep up in general and it was predicted that I would not necessarily reach the reading and writing comprehension required to pass my SATs. But, I always enjoyed stories and wasn't put off by my inability to articulate myself in prose or digest the written word quickly, I kept on reading. My parents pushed me to read outside of school too, I took special lessons and had a reading coach, eventually conquering my demons, being able to read and write at the rate of my peers by the time I was to go to "big school". It was at said big school that I was formally introduced to Shakespeare's plays and poetry and for the first time was struck by the power of language and how - aside from delivering instruction or conjuring two dimensional images - words, syntax, grammar and even punctuation could also have a profound and immersive effect on the reader. 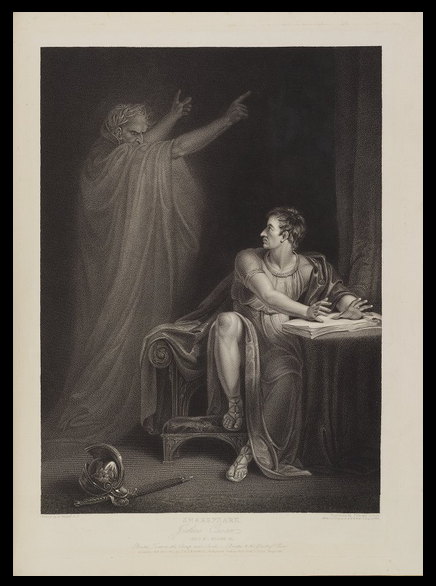 Depiction of Julius Caesar Act IV Scene III, the ghost of Caesar in Brutus' tent. I had never comprehended that we could discuss language for the sake of discussing language rather than merely discussing the outcome of language. Discussing the fabric and stitching, not just the dress. It's a small revelation, but it was the catalyst to a new way of thinking for me and it had a lot to do with William Shakespeare. 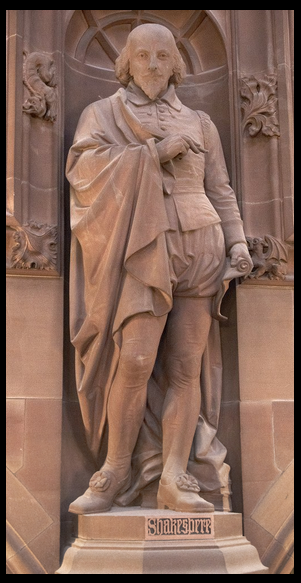 I'll be celebrating his genius with a visit to John Rylands Library on Deansgate to soak up the literary history and see his effigy in the Historic Reading Room. There's also a co-production of King Lear (my favourite tragedy, and the source of the above quotes) on from today until 7th May at The Royal Exchange Theatre in Manchester, details here. Not in Manchester? You could give these articles from the New College Group a gander instead. They uncover some of the words and phrases Shakespeare introduced to the English language, words you thought you knew the meaning of until you read Shakespeare and words you may never know the meaning of. Enjoy!